Cycling the international Selkirk Loop, through Idaho, Washington and Canada, along Lake Kootenay. Don’t have the time – or the quads – to ride the entire 280-mile Selkirk Loop in one go? Below are three rides showcasing the best the Selkirk Loop has to offer two-wheeled tourists. Riders looking for a shorter itinerary can sample the Silvery Slocan Side Trip on an 80-mile roundtrip from Slocan Park to New Denver. From Slocan Junction between Castlegar and Nelson, ride winding Highway 6 along the slow-meandering Slocan River, shaded with cottonwoods and surrounded by small farms. Pass through the funky artists’ enclave of Winlaw and climb above Slocan Lake on the eastern edge of Valhalla Provincial Park’s lofty peaks. Descend to Sandon and New Denver, with their rich mining history and small-town charm on the shores of Slocan Lake. Narrow, winding pavement demands concentration, so plan for plenty of stops to properly enjoy the views, some of the best in the west Kootenays. Local cycling clubs revere this network of cycling routes along the Columbia and Pend Oreille rivers. The scenic and mostly flat riding suits beginners, too. Starting in the tiny community of Waneta east of Trail, trace the contours of the Columbia River along the virtually flat Waneta highway. Strong climbers should continue out to Seven Mile Dam southeast of Waneta, where a 1.5-mile granny-gear ascent rewards riders with spectacular scenery along the Pend Oreille River. For a rolling route through idyllic farmland, follow Columbia Gardens Road out toward Fruitvale. Combine the two for a showcase of the west Kootenays’ best riding. Come autumn, larch enliven the steep hillsides above the river while the reds and oranges of orchard trees grace Columbia Gardens Road. This farm-to-market backroad alternative to Highway 20 from Newport north past Usk passes among lily pad-bedecked ponds and the pine-dotted foothills of exposed rock that comprise the southernmost Selkirks. 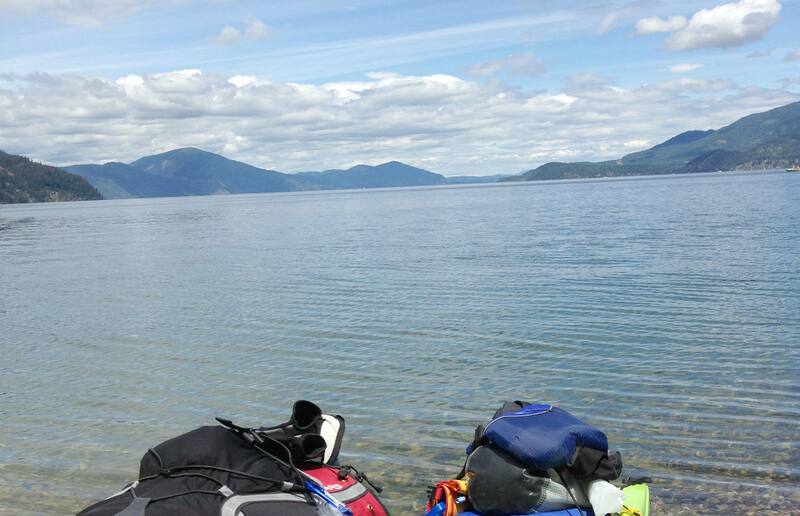 Past Usk, the route follows the Pend Oreille River through the Kalispel Reservation. Cyclists looking for a leg-stretching stop should explore the Manresa Grotto. Listed on the National Register of Historic Places and open to the public, the natural cave system at Manresa Grotto was the site of early Catholic missionary efforts in the region. A gentle path no more than 100 yards long approaches the main cave, where rows of flat rocks arranged as seats face a simple altar of mortared rock. McPherson notes that LeClerc Road has a high density of Airbnb accommodations, making it particularly attractive to cyclists looking to sleep on a real bed. Cyclists planning a Selkirk Loop itinerary need not reinvent the wheel, so to speak. “The International Selkirk Loop has been a popular destination for cyclists for a number of years,” said Stephanie Sims, executive director of the Selkirk Loop. A 2014 traveler survey compiled by the Selkirk Loop found that cycling was the second-most popular mode of travel around the loop, even ahead of motorcycles and RVs. Four tour organizations offer five different tours ranging from six to 21 days. For self-supported riders, the Selkirk Loop website also offers suggested five- and 10-day itineraries, complete with elevation profiles for each segment. Cyclists who carry their own food – or who don’t mind cycling back into town after a day in the saddle – will pass by several provincial parks and national forest campgrounds, including Kokanee Creek Provincial Park east of Nelson, Crawford Bay Provincial Park on Kootenay Lake, and Sullivan Lake near Metaline Falls. They’ll be rewarded for their efforts with some of the finest public lands camping in the region. Cyclists who prefer plusher accommodations can find lodging listings on the Selkirk Loop website; McPherson also recommends looking into the plentiful Airbnb offerings on the route. Although pannier space is at a premium, tourists should consider saving space for – or having shipped – artwork that they might find on the loop. Crawford Bay, in particular, is famed for its handmade wooden brooms; the Selkirk Loop has clearly marked the studios of many artists on the route with roadside signs. Sandpoint and Nelson, British Columbia, the largest communities on the loop, both have plentiful accommodations and clean, quiet and safe campgrounds. Sims said both towns are suggested overnight stops for all travelers. A bohemian enclave in the Kootenays, Nelson has a lively nightlife scene and dining to accommodate every appetite, from vegan to carnivore. Here and in Sandpoint, cyclists will find good coffee shops and all-important free Wi-Fi. More importantly, both towns have thriving craft-beer scenes, because a cold pint on the brewpub patio is perfect reward for the exertion of cycling, whether it’s a Sunday cruise or 10-day tour. So fun to read your article. We rode the Sirkick Loop for our 70 TH birthdays five years ago. We so agree with your account of this great ride. We had many wonderful encounters with the local people along our ride who were so helpful and kind. We are surprised that there a a lot of cyclist ridding the loop. We had many motorcycles doing the loop but only came upon three cyclist on our tour. Thank you for your time and effort to bring back so many wonderful memories.